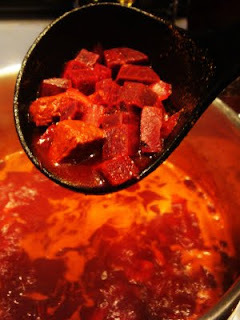 Borscht is a lot like minestrone in that every cook has their own special recipe. Here's mine. It's loosely based on a recipe I saw years ago in Alex Hawkes book on Vegetable Cookery. Wow!! It really was years and years ago, as his book was published in 1968, and I got my copy around 1970. I like this particular recipe because it uses lots of beets, a good thing then beets are ripening and ready to be pulled from the ground. I also like this recipe because it's so thick that it's really like a tasty stew. Finally, I like this recipe because the bright red color brings the reds of the fall leaves into the house and onto the table. Slice the flank steak into 1/2 inch strips, then cut the strips into small bite size pieces. Pour the olive oil into a heavy bottomed soup kettle over medium heat. Add the flank steak pieces and onion and cook until the flank steak is nearly done. Add the beets, stock, water, carrots, tomato paste and vinegar to the pot. Cook until the beets are tender, about 20 minutes. Season with salt and pepper. Ladle into individual serving bowls, and top each bowl with 1 tablespoon of sour cream or yogurt. Stealthy Cooking Tip: Make sure to top the soup with either sour cream of Greek yogurt. It makes the soup beautiful, and fun to eat. Kids will probably try to add just a little bit of white topping with the deep red soup. Adults may find that swirling the two colors together makes a pleasing bowl. Either way, it's a pleasing presentation that enhances flavor, too.